Jan 28 1 Powerful Step to Identify Your Subconscious Blocks Holding You Back from Your Ideal Weight. 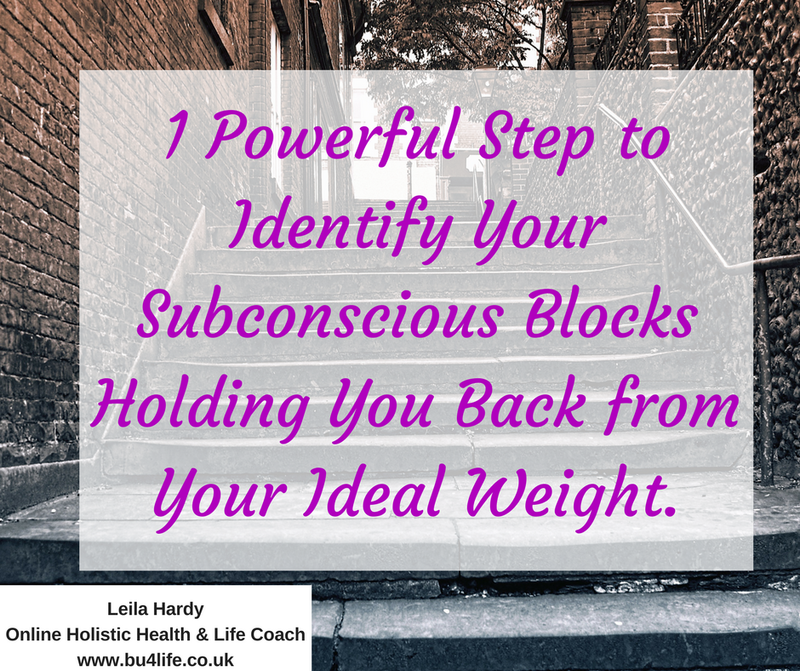 One Powerful Step to Identify Your Subconscious Blocks Holding You Back from Your Ideal Weight. I wanted to reassure you that you are only ever one step away from healing yourself, from identifying where subconscious blocks that are holding you back from your ideal weight have come from and what they are. And that step is that you need to go deeper. When you look at the issue; “the story you tell yourself about your weight”, you’re only looking at the symptom. You’re looking at the side effect of a deeper unresolved issue. If you have any habits of yo-yo dieting, all or nothing, punishment and reward relationships with food, with eating, and with exercising as well, then there is for sure going to be some deeper rooted unresolved emotions, beliefs, out of date programming occurring that will be controlling subconsciously what you put in your mouth, what you plan to eat, the lack of willpower you have, the lack of motivation you have to do those things. Some of you may have had some incredible weight loss week when first starting a new way of eating (I hate the word 'diet') because you may have stopped overindulging on alcohol and unhealthy treats and junk food and have gotten back into drinking more water, eating more whole foods, fresh fruits and such. So you’re going to have some great results. However, coming into week two and three of that new way of eating, that’s when you’re going to notice things start to slow down back to a normal and safe way to lose weight, of one to two pounds per week, which is a really powerful and consistent way to lose weight. However, if you have that mentality that that doesn’t feel like a lot because in week one you maybe lost five or six or even more, then actually you’re already setting yourself up for failure. And your subconscious is already starting to think, “If I’ve only lost two pounds this week or a kilo this week, then I must be a failure. I can’t do this.” And that’s when you start to create the self-sabotage, the procrastination that starts to get in your way. My step for you to identify the subconscious blocks that are holding you back is to go deeper. Look at the symptom which is the weight that you have to lose or the relationship with food, and look at where and why and how that is coming about. Take some time with a journal or just to sit still and listen to this and pause. And when I ask you these questions, ask them to yourself. Take some time just to slow down to allow your subconscious to start becoming a little more active rather than sitting in the background doing all the automatic things. As you start to become aware of those emotions, here is where we’re getting deeper, you can start to look at those emotions that have just come up for you and you can then start to explore how, when, where, and why those emotions started to come about for you. Because they are not the emotions you would have come about with when you came into this world; you’ve picked them up from somewhere. What experiences, what memories do you have where you were led to believe that losing weight was hard or that you couldn’t stick to anything? Who told you that you could not stick to anything? As you start to look at where those reasons came from, and if your subconscious is powerful and awake enough for you to be able to highlight those things for yourself, that’s brilliant. Give yourself the opportunity to look at where they came from and then when you go another level deeper, that’s when you’re rewiring, reprogramming and resorting all of those old programs and old beliefs. You can start to reframe those self-talk things that are going on like ‘this is hard’ to ‘this is easy’. ‘I can’t stick to anything’ to ‘I am totally consistent at everything is set my mind to’. Just to share my first hand experience about that, I always gave myself the belief that I was not consistent with anything. But I tell you what, I was consistent. I was consistently mistreating myself every day when it came to food and my weight! So actually, I totally have proof and evidence that I could be consistent. I just have to switch that consistency to something positive as opposed to something negative and self-sabotaging. Give yourself the opportunity to do that. We’ve looked at the symptom. We’ve gone to the emotions. We’ve gone one level deeper and looked at the beliefs and the instances that have caused those emotions. We’ve gone two steps deeper and now we’re going three steps deeper where we’re looking at rewiring and reprogramming and changing all of those things. That’s where you get to the powerful stuff. If you’re always focusing on the top layer and ignoring any of these deeper layers, that long-term success is always going to feel like it’s just too far away for you to get to. It’s going to be like a never ending race that you will never get to the finishing line of. Give yourself the gift of just being still for a few moments as you listen to this and go deeper. Allow yourself to tune into you and the power inside of you that you have to be able to understand yourself, to heal yourself at a deep cellular level. Because you do have that power. And once again, you maybe just don’t believe that you do and that’s a powerful belief in itself. Give yourself an opportunity to do that. If you’re not aware of what’s going on or you’re struggling to tap in to those deeper layers, then reach out to me because this is exactly what I take my clients through, that's going to give you the opportunity to go into those deep layers. And once you’ve gone deep, that’s when we start to rebuild with everything that you want for your life, for your weight, for your health, and your relationship with yourself and with others as well. Don’t be afraid to go deeper, because it’s one of the most liberating, phenomenal, life-transforming things that you can experience. And it’s that opportunity for you to change the course of your life. I get that it might feel a little bit scary but actually, your story is that you don’t want this weight anymore. So give yourself that opportunity to let go of that story and actually create a new story for yourself. That story that is around being healthy, happy, wanting to be confident in your own skin, wanting to shed weight easily and effortlessly, whatever that might be. Give yourself that powerful gift of being able to do this and being able to also empower yourself and understand yourself to do this. Because that power is within you, I promise you. You may just need somebody to help you turn the key to unlock it a little bit more, but actually you do have that power and understanding within you. You just need to slow down enough to be able to tune into it and tap into it. I’m here to help you, cheer you on, support you, listen to you, hear you, and suggest all sorts of incredible opportunities for you to look inside yourself and really allow yourself to transform and change at a deep cellular level. Give yourself that opportunity to pause, sit still, and work through some of these with a journal or in your thoughts. I suggest you get them down on paper somehow or in writing and give yourself that opportunity to just go that one step deeper than you have been doing.